Moderne und traditionelle Gitarrenmusik des 20. Jahrhunderts Werke von Brouwer, Ravel, Villa-Lobos u.a. 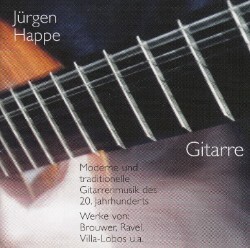 Modern and traditional guitar music from the 20th century Works by: Brouwer, Ravel, Villa-Lobos etc.